Ok, so the just launched Skype 1.1 for iPhone doesn't support push notifications, but eBuddy, a brand new app for the iPhone or iPod touch does support push notifications. What does this mean? It means you can close eBuddy and still receive instant messages (IMs) from your buddies. 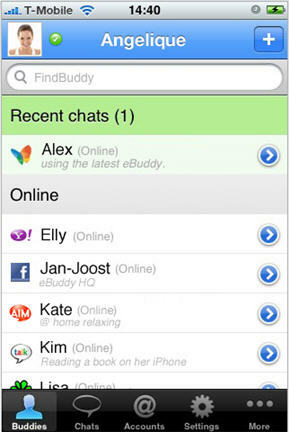 Further, eBuddy is an IM aggregator supporting MSN, Yahoo, AIM, ICQ, Gtalk, and Facebook. Too bad they don't support Skype though like fring does. eBuddy also supports Google Android phones. Push notifications for incoming messages are only available if you have the latest iPhone 3.0 software on your device. eBuddy will also soon be adding landscape mode. Oh, and did I mention unlike similar app Beejive ($9.99) & IM+ with Push ($9.99), eBuddy is a free app in the Apple App store? Some minor complaints include it only supports push for up to 30 minutes and it doesn't support file sharing (audio, picture, etc.). Still for a free IM aggregator app, this one is definitely a must for the iPhone! Whatcha waitin' for? Go grab this cool app now! Push notifications for incoming messages are only available if you have the latest iPhone 3.0 software on your device. eBuddy will also soon be adding landscape mode. Oh, and did I mention unlike similar app Beejive (\$9.99) & IM+ with Push (\$9.99), eBuddy is a free app in the Apple App store? Some minor complaints include it only supports push for up to 30 minutes and it doesn't support file sharing (audio, picture, etc.). Still for a free IM aggregator app, this one is definitely a must for the iPhone!